Our company is a China office supply wholesaler. We can provide kinds of office supplies, our office files are of good quality and reasonable prices. Here is our ring file. If you click the icons below this picture, you will turn to other similar products pages. They are for different office uses. Welcome to choose upon your needs. The ring file is regularly used in company handbook, product brochure and bidding documents etc. 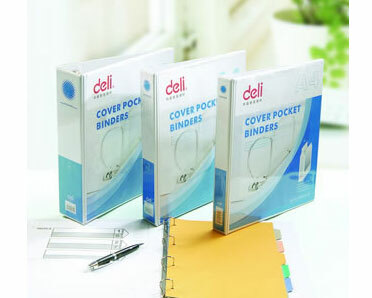 Deli can also provide many other kinds of office supplies to you. » Arch Binder1. The design of high-quality metal ring hole facilitates the extraction. 2. Colorful labels are available inside the PP ring binder which offers convenient index. 3. Beautiful colors and styles. » Clear BookPP and PVC clear books, paperboard clear books and environmental protective clear books are all available. It is a kind of commonly used office supplies in companies or at home.